Flaring continues on Wednesday evening with a moderate M3.9 solar flare around sunspot 2087 at 21:03 UTC. The event was associated with a short duration Radio Burst (TenFlare) measuring 420 solar flux units (SFU). Additional flaring is likely. More updates to follow regarding a possible CME. Stay tuned for the latest information. What an active day, after a minor impulsive M-class flare from region 2080 the new region 2087 produced an M3 class solar flare, it was short in duration so we expect no associated CME with it. 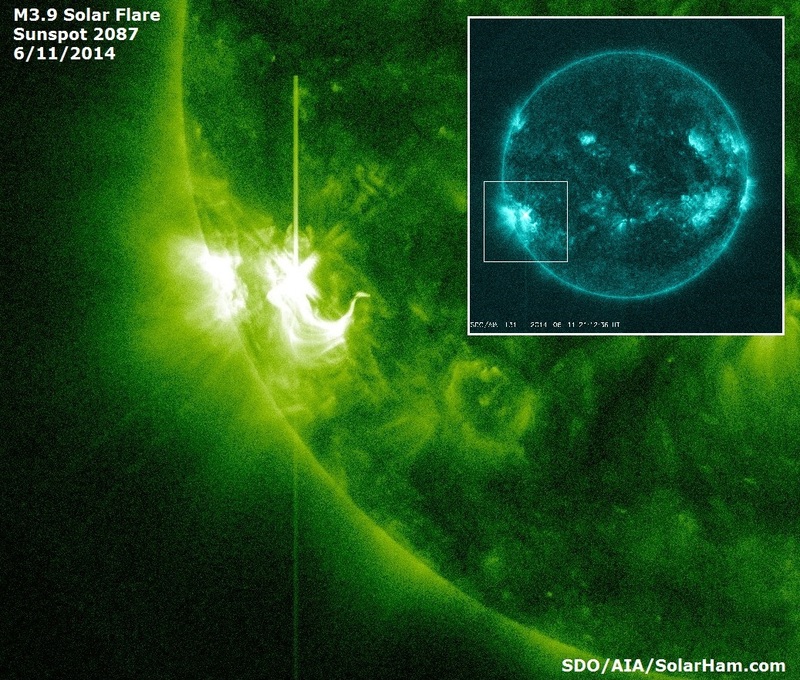 One hour later Active Region 2087 produced it’s third X-class flare, it was exactly X1.0. Unfortunately our alert system suffered from a minor bug and tweeted it as an M8 flare, we excuse us for that. The bug will be resolved later today. Active Region 2087 looks to be in a phase of growth, it is still difficult to determine it’s magnetic complexity because it is still near the limb but from first sight there looks to be a delta structure within the region that’s strong enough to produce further flares. Later today, when LASCO imagery is complete, we’ll take a look if there was a CME associated. Watch us for updates. We recommend opening up to the influence of spirit and channeling the higher realms as often as you can, because doing so introduces you to the divine like never before and helps you flow the understanding that when you find the greater perception so many of you have searched endlessly for, you become infinite. In a scenario that could’ve been extremely devastating, the United States narrowly averted a nuclear disaster in 1961 when an atomic bomb nearly detonated after falling out of a B-52 bomber that broke up in the sky. According to the Washington Post, the incident took place on January 21, 1961 – less than 20 years after nuclear bombs were dropped on Hiroshima and Nagasaki – and is explained further in a recently declassified report published by the National Security Archives. The Italian authorities stranded refugees without food or shoes in car parks outside Rome and Milan, says the UN. Italy is struggling to deal with the 50,000 immigrants that have arrived this year and has asked the EU to help mitigate the crisis. The UN High Commissioner for Refugees has condemned Italy’s treatment of a group of refugees who were found abandoned outside Milan and Rome in what the organization described as an “unacceptable” incident. The refugees “were found without shoes, disorientated, and without having been given anything to eat or drink,” said the EU body’s spokesperson Carlotta Sami told AFP. The immigrants from Mali, Guinea Bissau, Ghana, Nigeria, Senegal and Syria were transported in two busloads to Milan and Rome where they were abandoned in car parks.